10/10 : as a way of losing 5lb in weight in a week. However, I did feel well enough today (finally! I've had this thing since last Thurs!) 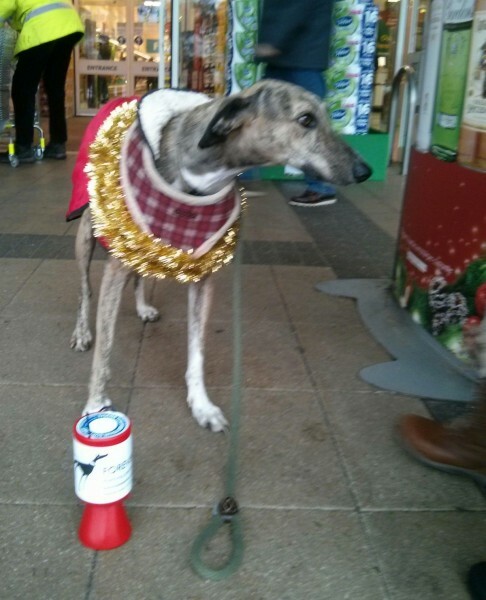 to take Brythen over to join in with the supermarket collection that I had volunteered for a few weeks ago (for Forever Hounds Trust, which is what used to be Greyhound Rescue West of England). Despite appearances, he loved it. There were three assorted greyhounds there: he loved the two little ones (found the big one a bit scary). Plus, a lurcher and a couple of funny little random dogs came to say hello. There was a lot of play-bowing. Also, he got to cuddle a large number of shoppers. Brythen loves cuddling random humans, and it turns out that most people who shop at Morrisons in Tavistock also love cuddling Brythens. He made an excellent chugger, as he kept wandering up to people and leaning on their legs adoringly until they put money in his tin. This was not a Rosie-friendly activity. She would have hated it so she stayed at home on her sofa. I had great difficulty persuading Brythen that it was time to leave all the friendly shoppers and dogs and go home. I just heard that the collection made £260! Well worth the effort. Oh, no! for the winter virus. Hope you're soon feeling fully recovered. Brythen is irresistible. If he leant against my leg adoringly, I would happily give him all the money in my pockets. But not all the sossidge, because that would make Max very grumpy. I would totally give him all my money as well. This seems to be a common response to the stealth attack of adoring Brythen. Are Brythen's ears as soft as they look? They are soft, huge and squishy. The other 2 volunteers kept falling over laughing because Brythen would stand there and get his ears out, and they are just so much bigger than greyhound ears! I would definitely hand over all my cash to those ears. And the soulful eyes. I might be a sucker for cuddly hounds. He made an excellent chugger, as he kept wandering up to people and leaning on their legs adoringly until they put money in his tin. OMG! I would have fallen for that ploy! I was just thinking before I read the next part that this would probably have been an activity that would not have appealed to Rosie Roo! Oh well, we all cannot be good at the same things! I love the livery he is wearing (or whatever one might call it!). Rosie does sometimes like to greet people, but not always. She is much more discerning about her company! I really hope this bug is over. I have had MORE than enough of it! I miss being leaned on. I looked at their website the other day. I'd prefer to have another lurcher than a grey but not now when the kids are so small. One day though. He is just bloody lush isn't he. I'd have paid good money for cuddles. Hope you are soon fully recovered. It's a little sad really: I'm sure Rosie would have more fun if she could have a more Brythen-ish attitude!